The team that was in Baltimore until 1984 travels to their former home to play the team that now hails from Baltimore. That’s an interesting tidbit for NFL historians, but isn’t likely to be a factor here since most of the players on both sides weren’t born when the move was made. What will motivate those players, though, is that the season will end for one of these teams at the final whistle of the game. This is far from an expected matchup. Few will be surprised that the Ravens are a playoff squad. They have made the postseason each of the last four years under Jon Harbaugh and Joe Flacco. Indianapolis, though, is frankly shocking. They rebounded from earning the first overall pick last year to winning 11 games this year. They lack depth and faced massive adversity, but they just haven’t quit. Their odds of winning the Super Bowl are the longest of any remaining team now, but that’s nothing compared to what they were when the season started. The Pagano factor - The emotional wave that has carried the Colts this far has been truly remarkable. Losing a coach for most of the season to leukemia treatment would have devastated most teams, but it has been a rallying point for the Colts — in large part thanks to the brilliant interim work of Bruce Arians. Pagano returned at the end of the season, and that was again an emotional rallying point. A team can only play on emotions for so long, though, and sooner or later the Colts are going to run into a wall on this front. Besides that, even though Pagano and Arians are very close, there is inevitably going to be a bit of an issue when coaches are changed during the season. There’s also the further potential distraction that Arians is an in-demand coach with so many head coaching openings in the league right now. I’m not suggesting that the Colts are going to crash and hit a wall this week — they have made it this far. It’s certainly something that needs to be considered by handicappers this week, though — as it has been each time the team has played since Pagano became ill. Another factor to consider here is that the whole Chuckstrong saga ensures that virtually everyone outside of Baltimore will be cheering for the Colts and that the public will be drawn to them much more than they otherwise might. That will have an inevitable effect on the way lines are set and how they move. Which Flacco shows up? - We know what we are likely to get from Andrew Luck — some stellar play at times, with some questionable decision-making magnified by a lack of talent around him at other times. In short, he’ll play like a rookie on a team lacking depth — albeit a spectacularly talented rookie. What we can be less certain of, though, is how Joe Flacco will play. It definitely hasn’t been Flacco’s strongest season. Actually, it has been only marginally better than his weak season last year. He has particularly struggled this year down the stretch, with QB ratings of 76.5 or lower in four of his last seven games (QB ratings are far from a perfect stat, but they are at least an indicator of his struggles). He has let his team down in key spots, and he was largely to blame for the last two losses. He still has the ability to shine — he was absolutely brilliant in Week 16 against the Giants. The week before and the week after, though, he struggled. Your ability to predict which Flacco shows up will have a big bearing on your ability to pick a winner here. Can Indy stop the run? - The Colts are an absolutely lousy team when it comes to defending the run. They allowed 137.5 yards per game — 29th worst in the league. Baltimore doesn’t have an elite running attack, but they are 11th in the league in yards, and Ray Rice can be as dangerous as anyone on a given day. The ability of the Ravens to run will have a defining effect on the outcome of the game. Ravens injury issues - The Raven have been hit hard by injury issues this year. Lewis, Bolden, Ngata, Suggs, Webb — the list of key injured players is long. It also creates a lot of uncertainty heading into this game. Webb is out for the year, but the rest are uncertain. The biggest story is that Ray Lewis is active and could play. We likely won’t know for sure until close to game time, but it promises to be a distraction both for the public and the team. The others were out last week to rest injuries, and should be ready to go this week. In each case, though, we can’t be completely sure of how close to their potential they will be ready to perform. The game opened with the Ravens favored by 6.5 points at home, and the line has stayed consistent at that level so far. Action has been quite heavily tilted towards the Colts so far, so it would be a surprise if the line climbed to a touchdown. The total opened at 46.5 and has fallen slightly to 46. 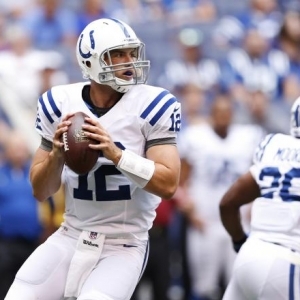 The Colts are 8-0 ATS in their last eight meetings in this rivalry. All of those games came before the Luck era, though, and all but one featured Manning, so that doesn’t mean much here. Baltimore has gone “under” the total in each of their last four playoff games as a favorite. I’m torn in this one. I don’t think the Ravens are going to lose this one — they are at home, they have the experience of getting ready for playoff games, and they have much more depth. I’m not confident that they will win it handily, though. I’d be much happier if the line was smaller, but it’s obviously not. I deeply respect what the Colts have done, but their lack of playoff experience, their youth, their defensive challenges, and the significant role emotion has played up to this point makes it hard for me to trust them. I have to take the Ravens at home.